Looking for a way to keep special memories close to your heart? 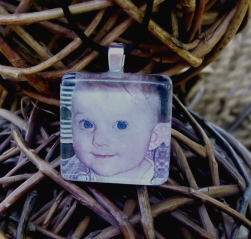 Our custom photo pendants are the perfect solution! Just email us a high quality, uncropped photo and we can turn it into a keepsake you will treasure forever! Facial close-ups, and bright well-lit photos typically work the best. You may specify to leave the photo color, or alter it to black and white, or sepia. Within 48 hours we will email you the image, cropped and edited, for your approval. Searching for that special gift to give your bridesmaids that they will still enjoy after the wedding? 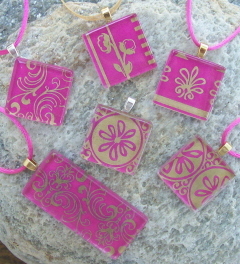 A necklace is the perfect gift! We will work with you to get an idea of your wedding colors to find the perfect match. Our wide variety of designs and colors ensures that we will find the perfect set to coordinate. Depending on the design you choose, we may be able to able to make all necklaces identical, or we can make different cuts of the same design for a more individual, one-of-a-kind gift that still coordinates. These would make great gifts for other members of the wedding party as well. We hope they add another wonderful memory of your special day!